In the lower left hand corner of the Request tab of an open job are the 'Copy this job' button and the 'Repeat this job" button. They are available for any job that has been saved and has a number. So which one should you use and when? If you want to use most of the information in an existing job but change some of it, then use the 'Copy this job' button. It will do exactly as it says. It will copy the job and you need to edit the information before saving the copy. The only thing that is blank is the date. If you want to clone a job for the same location, LEP, time, etc, but on (a) different date(s), then use the 'Repeat this job' button. 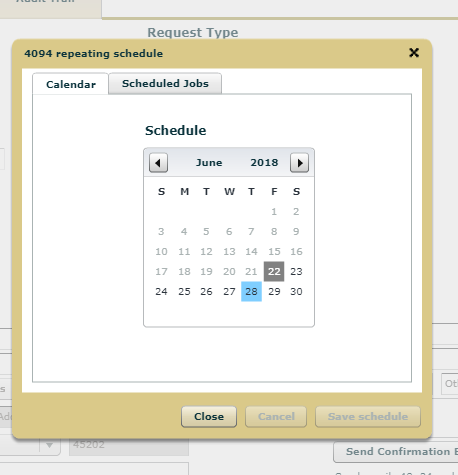 It will pop up a calendar which allow you to mark the dates you want this identical job repeated on. You just highlight the dates you want to have it repeated on then click the 'Save schedule' button. 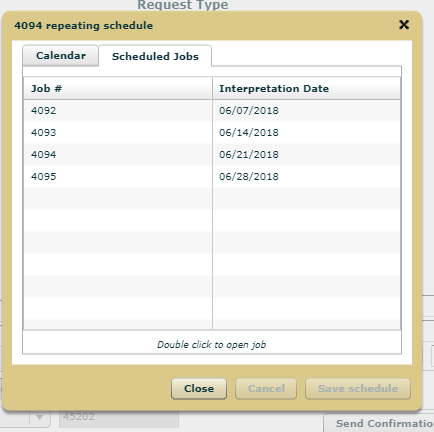 If you click the Scheduled Jobs tab, you can see what dates are already related to this job. Please note that clicking 'Save schedule' does not create the jobs. Those will be created when you save the request. You will see a list of the jobs that were created. In the above example, jobs 4093 - 4095 are clones of 4092 but on different dates.